There is no more beautiful animal on the North American continent than the Stone Sheep. South Central Yukon is the northernmost boundary of the true Stone’s range and our concession contains well over half of the Yukon’s entire Stone sheep population of roughly 3000 animals. In our opinion, this region of the Stone sheep range produces the most beautiful of all the many color variations found in Stone rams. Characteristic of these Yukon Stone rams, their color will range from grey to near black on their rump and body to a salt and pepper color on the shoulders to a very light colored neck and head. Color will also change a bit as the season progresses with rams becoming darker as their hair lengthens and their coats thicken in preparation for colder weather. These photos show the range of coloration typical of the Stone rams in this concession. Your hunt will begin when you land on one of our lakes or remote bush strips to meet your guide and in most cases a string of horses to assist in your adventure. From there you will ride, climb, and glass until you find a mature ram that is worthy of your wall. Needless to say, this type of adventure is not for the faint of heart and it is critical that you arrive in good physical shape, ready to hunt (click here for fitness info). 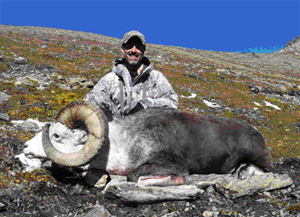 While many rams are killed in the first few days, there is a reason these hunts are two weeks long and as such, you should be prepared to hunt hard from day one to the last day as we expect everyone who books a hunt to have a solid opportunity to kill a mature ram. We conduct four hunts for Stone Sheep beginning August 1 thru the middle of September. Each of these hunts will produce rams equally well so let your preference weather and schedule preference guide your hunt timing choice. As all of our hunts begin to fill up 2-3 years in advance, we recommend you plan well ahead of time to secure your preferred dates. Whether you are a first time sheep hunter or a veteran of high mountain passes, Yukon Stone Outfitters is the right place for you.